Included in the Unesco World Heritage list for its beautiful Baroque buildings, Catania is a dynamic and lively city with buildings and monuments that bear witness to its ancient and varied history. Founded in the 8th century BC, in the 14th century and the Renaissance, Catania was one of Italy’s most important and flourishing cultural, artistic, and political centers, seat of the first university in Sicily, opened in 1434. Today, Catania is one of the main economic, touristic, and educational centers in the island, being an important hub of industry, thus gaining the nickname, “European Silicon Valley”. 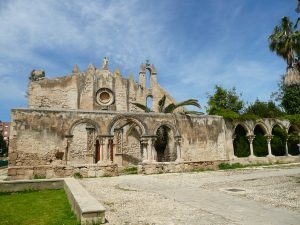 After an orientation tour by car, you will enjoy a walking tour of the historical centre including: the main Piazza Duomo, one of the most beautiful squares in the island, adorned in the centre with the Fountain of the Elefante, the “Liotru”, the symbol of Catania made of lava stone, topped by an Egyptian obelisk from Syene; the Cathedral dedicated to St Agatha, the patron Saint of the town, dating back to 1070–1093 and rebuilt after the 1693 earthquake; the Greek-Roman Theatre/Odeon; the Ursino Castle built in 1239 by the military architect Riccardo da Lentini for Frederick II of Swabia (Stupor Mundi); the Benedictine Monastery of San Nicola l’Arena the second biggest in Europe with its magnificent double staircase leading to the second floor decorated with ten stucco bas-reliefs and the beautiful eastern cloister used by monks as a winter garden. The lively and colourful historical fish market gives a unique chance to be part to the town’s everyday life (open morning time from Monday to Saturday, holidays exclusive). Next stop is Mt Etna, the biggest active volcano in Europe currently standing 3,329 m (10,922 ft) high, though this varies with summit eruptions. According to Greek mythology, the deadly monster Typhon was trapped under this mountain by Zeus, the god of the sky, and the forges of Hephaestus were said to also be located underneath it. 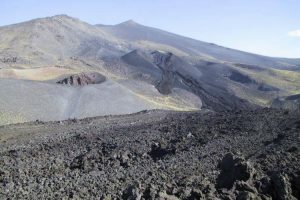 Due to its history of recent activity and nearby population, Mount Etna has been included in the UNESCO World Heritage List on June 2013. 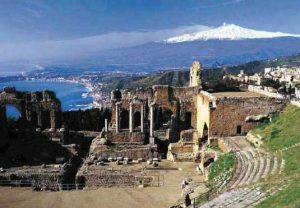 Placed at the foothill of Mt Etna, Catania is the second biggest city in Sicily, a dynamic and lively city founded in the 8th century BC as a Greek colony of Chalcidic origin. In the 14th century and the Renaissance, Catania was one of Italy’s most important and flourishing cultural, artistic, and political centers, seat of the first university in Sicily, opened in 1434. Destroyed in 1969 owing to a he lava eruption and later in 1693 for a heavy earthquake, the city was then rebuilt in the Baroque architecture that nowadays characterizes its buildings and monuments. For it magnificent Baroque style historical centre, Catania is included in the Unesco World Heritage list. You may decide to get the cable-car up to 2500 mt and then by off road buses up to 2900 mt to admire the fantastic lunar landscape close to the main crater! (optional. Please, consider this option lasts about 2 hours). 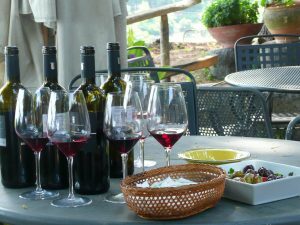 Proceed to the north-eastern flank of the volcano for a visit to top boutique winery set on Etna’s slopes at an altitude of 700 metres above sea level. The estate belongs to an important noble family involved into wine making since 1726. The vineyards slope down towards the sea into a natural amphitheatre and produce excellent D.O.C. Etna wines. The characteristic mountain climate, the particular exposition, the presence of bordering oak and chestnut forests create, besides an enchanting landscape, a “unicum” for the production of wines with a marked personality. Mt Etna is the biggest active volcano in Europe currently standing 3,329 m (10,922 ft) high, though this varies with summit eruptions. Due to its history of recent activity and nearby population, Mount Etna has been included in the UNESCO World Heritage List in 2013.